The architect Louis Le Vau was already widely celebrated when Fouquet called on his services in 1653. As the King’s “Principal Architect,” he had erected a number of Parisian mansions including the Hôtel Lambert. Considered the greatest ambassador of the Italianate style in France, Le Vau also drew inspiration from classical antiquity. 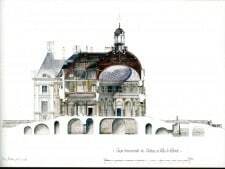 Drawing on these traditional sources, he then created a powerful new style of his own, starting with Vaux-le-Vicomte – and thus lay the foundations of French architecture for the next 150 years. Majestically laid out along a four kilometer axis, the château of Vaux-le-Vicomte surges from a series of planes like a theatre set. The outbuildings in its forecourt guide the eye past tall gates (an innovation for the period) to the façade, as if at the center of a “mise-en-scène.” The gardens can be spotted on either side, arranged in vast terraces that follow the natural slope of the land. The great axis dominates every aspect of this composition, cleverly balanced at times to mask asymmetries. It creates a sense of transparency, passing through the château’s entrance hall and Grand Salon, so that the statue of “Hercules at Rest,” can be glimpsed two kilometers further south. Though Le Vau had already experimented with this innovative lay-out, it was at Vaux-le-Vicomte that he broke away from the rigid architectural principles that had prevailed until then: buildings should be simple structures one room wide, facing a courtyard on one side and the gardens on the other. Rooms were therefore interconnected, limiting privacy. Those on the ground floor were considered utilitarian, while those on the second floor were used for ceremonial purposes. In the early 1650s, Le Vau introduced a new concept: rather than place rooms one on top of the other, he placed them side by side, thus doubling a building’s width. This meant that the traditional high, straight roof had to be adapted to the greater width, leading to the introduction of the hipped roof which would mark his style. 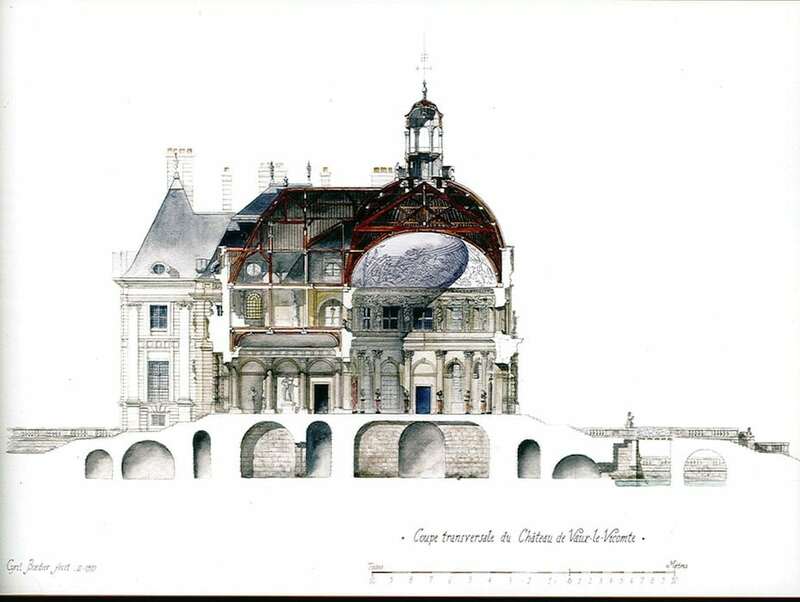 At Vaux-le-Vicomte, he was particularly pleased by the ovoid-shaped central dome that was both a technical and aesthetic feat. Le Vau nevertheless retained the outmoded “high” roofs for the corner pavilions, as well as decorative moats and drawbridges, to balance the wide garden vistas, adorned with abundant fountains. This new juxtaposition allowed greater freedom in room lay-out. 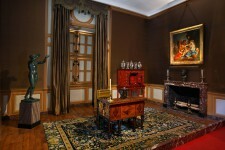 On the ground floor, the Salon d’Hercule forms an ante-chamber to two further sets of rooms set in staggered rows. Upstairs, four distinct suites of rooms branch out from a central corridor, offering a level of privacy hitherto unknown. The ground floor became the ceremonial level, with the more intimate private apartments above. This new layout would be copied the world over and is still in use today. The visit of the château is organized around four levels, decorated and furnished as if Nicolas Fouquet and his family had recently left the place. It is composed of Nicolas Fouquet’s private apartments on the first floor, followed by the ceremonial salons on the ground floor and the staff rooms and kitchen in the basements. The exhibition “André Le Nôtre at Vaux-le-Vicomte, the seminal work of French Formal Garden” closes the visitor circuit. (Caution : works are currently in progress around this exhibition, it will only be open to visits from May 10, 2016, onwards. On that date, it will have changed place to be presented in the château’s western outbuildings). Option (3€): Visit the framework of the dome, culminating above the château and discover a 360° breath-taking view all around the estate. Caution: some rooms may be closed to the public, we apologize for the inconvenience. You will be able to admire the apartments of Monsieur and Madame Nicolas Fouquet, the display insisting on the inhabited aspect of these richly decorated rooms, furnished with the previous owner’s favorite work of arts. You will be immediately immersed in the everyday life of a 17th century Grande Demeure. 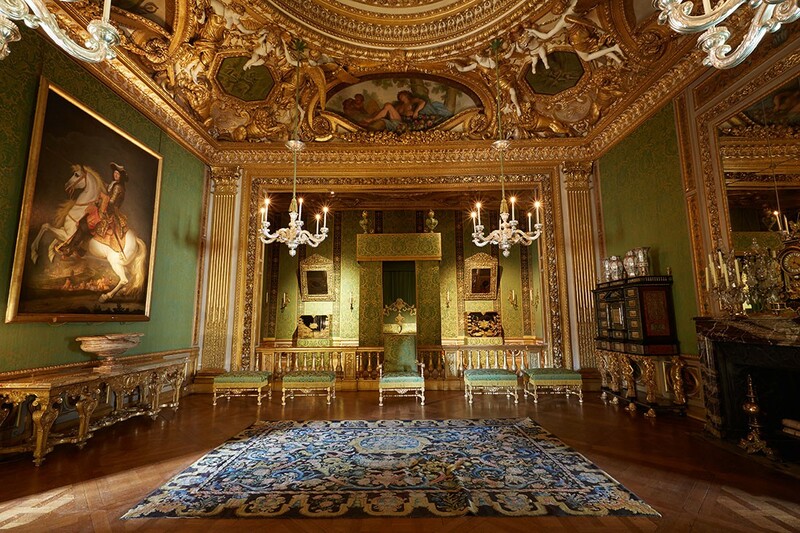 From the Great Square room to the Muse’s room, going through the Games parlor and the King’s bedroom : the Ground Floor is embellished with the most baroque and remarkable decorations. The furniture, the tapestries, the bronzes, the statues and the busts are staged in order to let the visitor wandering in the château’s intimacy. 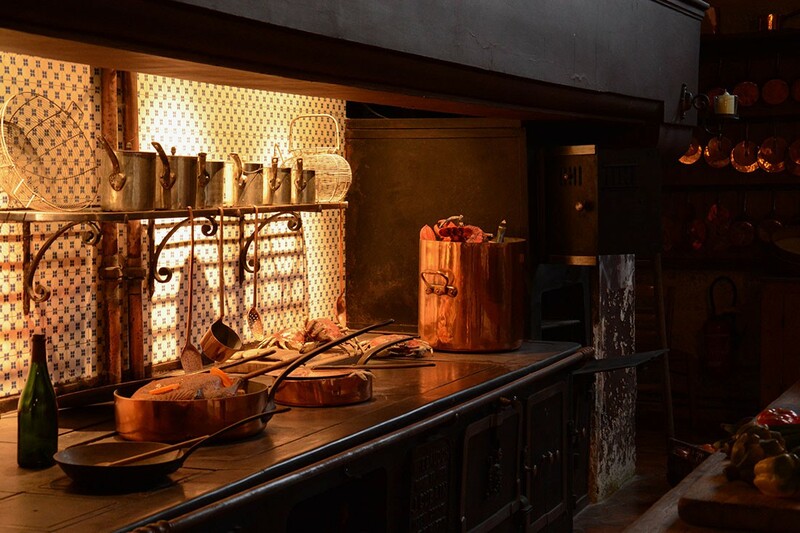 Your visit will continue through the “people’s room”, the kitchen and the vaulted cellar, that will drive you into the backstage of of the château’s lifestyle. From the highest point of the château, you will be able to admire a 360° view around the estate… from 25 meters high!